"Named from the river being well stocked with shellfish resembling the pipi, but slightly larger and called by the Maoris 'Kaeo'. They used to come long ago and gather it, and so in time going to the Kaeo meant to this particular section of the river, where most of this fish was found." 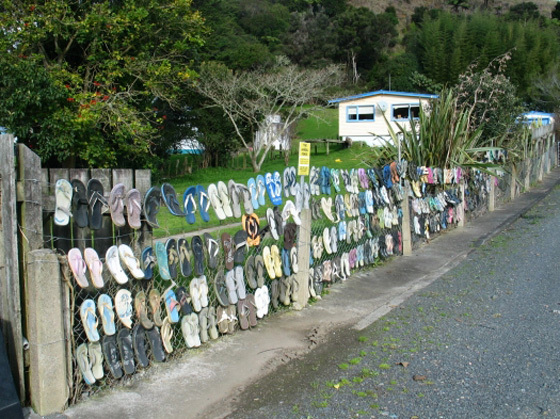 Kaeo Farm & Fuel's famous "Jandal Fence" beside Leigh Street/State Highway 10, Kaeo. Built on the flood plain of the Kaeo River, the town has experienced destructive flooding. It came to national attention in 2007 when it took the brunt of three major floods within the space of a few months - in February, March and July. Water flooded homes and shops and destroyed the local primary school's pool-complex. The local Rugby Clubrooms also suffered, and the club received much support from the whole country as it raised funds to lift the clubrooms off the ground to minimise the risk of damage from further flooding. Landslips, fallen power lines, and road closures resulted from heavy rain in February 2008. The Northland Regional Council scheduled flood-protection work for 2008. Floods occurred as a result of Cyclone Wilma in January 2011, and 70 people had to be evacuated from Kaeo. Paid for by a targeted rate (tax) on the local community, the first stage of the Kaeo Flood Mitigation works, with stopbanks and diversion channels, was completed by Northland Regional Council's contractors in April 2014. 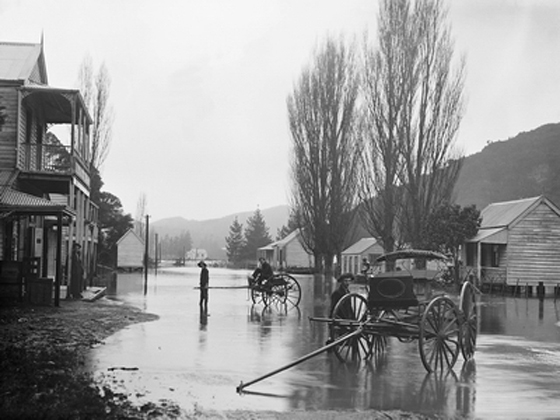 Historic Flooding in Leigh Street, Kaeo, 1910. Photo courtesy of Alexander Turnbull Library. Historically, flooding is not a rare occurrence in Kaeo. In the 1960's the main street, Leigh Street, was raised by about a metre to mitigate the effects of floods. However, the frequency and volume of the floodwaters in recent years is unprecedented and may be attributed to climate change. The challenges faced by Kaeo's residents in recent years has served to strengthen the sense of community in this close-knit population, and this is reflected in the town's motto: "Small town, big spirit". The 2006 New Zealand census reported a population of 495, an increase of 3 from 2001. Kaeo has a BP petrol-station, a pharmacy, a Farm and Fuel store, a bookshop, eateries, a hairdresser, a bus company, mechanics (2), a tyre-shop, a transport company, a Sanfords Fishery factory, a 4-Square shop incorporating a Post Office, a Far North District Council service centre and Library, a primary school with around 126 students and a college (high school) with a roll of 80 students. Kaeo is also home to the Whangaroa County Museum and Archives Society. No visit to the area is complete without spending some time viewing the museum's many items and exhibits that tell the stories of this fascinating and historic area. 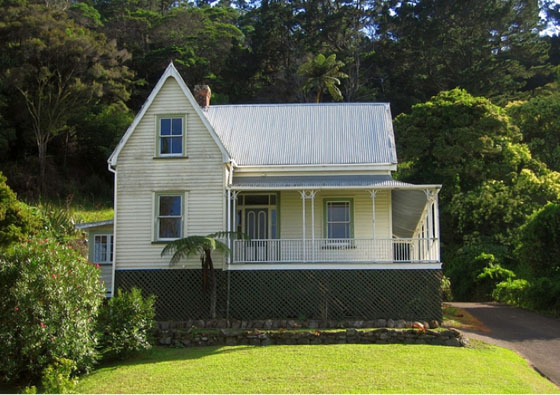 One of Kaeo's stately old colonial homes in Leigh Street. 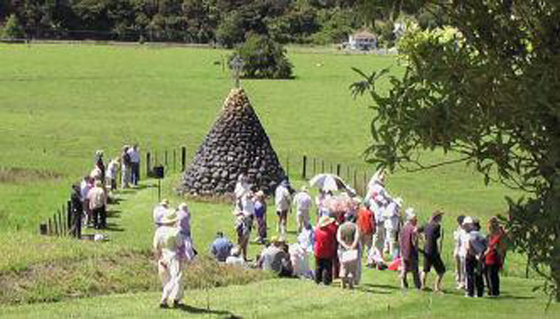 The large conical hill in the centre of the valley and just south of the Police station is Pohue-nui, the former pa (fortified village) of the Ngati-Uru tribe. The pa's defensive terraced slopes are still clearly visible as one approaches Kaeo by road from the south. Kaeo is the site of Wesleydale, the first Wesleyan Mission in New Zealand. On 6th June 1823 the first members of the mission arrived at Whangaroa harbour aboard the ship, St Michael. 2 days later, on Sunday 8th June 1823, the Reverend Samuel Leigh preached his first sermon in the area. The Wesleydale Mission comprised several members. It was led by the Reverend Samuel Leigh. He was accompanied by his wife Catherine, and joining the Leighs were Reverend William White, Reverend Nathaniel Turner, John Hobbs, James Stack and Luke Wade. WIth the aid of their Anglican Mission colleagues from Kerikeri, the Wesleyans arranged with the chiefs Te Ara and his brothers Te Puhi and Ngahuruhuru for an area of land on which to set up the Mission Station. On 10th June a site was chosen on the southern bank of the Kaeo River, across from the kainga of Ngati Uru and opposite Pohue Pa. They named it 'Wesleydale' in honour of their order's founder, John Wesley and its valley location. Their decision to settle there was followed by strenuous labour during a period of incessant rain and stormy weather. Under White's energetic supervision, and with much assistance from James Shepherd of the Anglican mission station in Kerikeri, the men of the mission soon built a number of dwellings for their own use, the local Maori population's needs, and various outhouses for their animals, equipment and provisions. 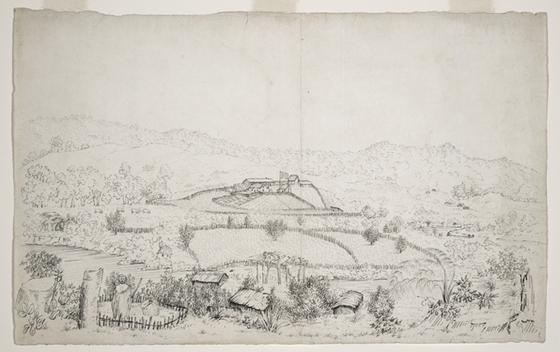 Turner, Nathaniel (Rev), 1793-1864: Wesleydale Mission Station, Kaeo, Whangaroa, Northland. 1825 or 1826?. Wesleydale was the first Methodist mission in the world. 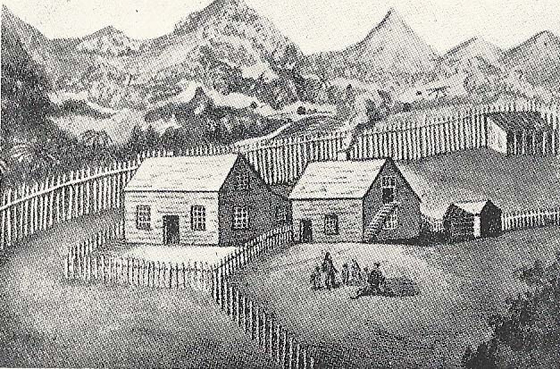 In his letter to the Wesleyan Missionary Society in London accompanying his drawing (above), the Reverend Nathaniel Turner proudly describes the mission's various buildings as comprising Reverend Turner and his wife Ann's cottage, an additional cottage for some of the other missionaries, a large school-house with accommodation for Luke Wade and his wife, a store for native provisions, accommodation for native female staff, a carpenters workshop, a barn and a boat shed on the river. This is thought to be in the year 1825 or 1826. The Mission's leader, Reverend Samuel Leigh suffered from poor health and not long after establishing Wesleydale, his health deteriorated to such a degree that in September 1823 he was forced to return to Port Jackson (Sydney) with his wife to recuperate. After Leigh's departure, Reverend Nathaniel Turner assumed leadership of Wesleydale for the rest of its existence. Reverend William White departed Wesleydale in November 1823, returning in February 1824, then departed for good in September 1825. The terms of Wesleydale's tenure at Kaeo were not always clear between the missionaries and their Maori hosts, and the need to secure the patronage of the local Maori leader was something that the Wesleyans failed to recognise. 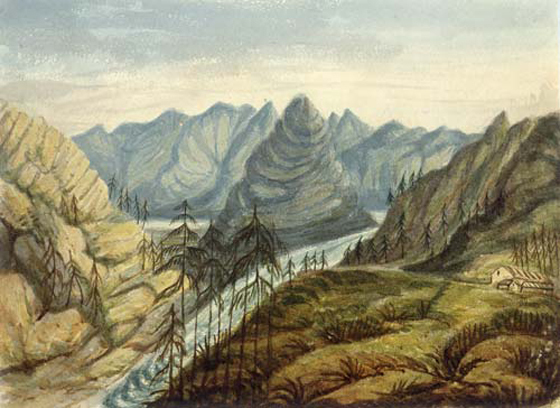 Four years later, tensions between Hongi Hika and local tribes swept through the Whangaroa area, and in January 1827, with the threat of possible attack by warriors looming, the Mission had to be abandoned. In the absense of any men of the cloth, warriors looted and totally destroyed the Mission. Under the leadership of the Reverend Nathaniel Turner, the Mission was re-established a year later at Mangungu in the Hokianga. This mission baptised its first converts in 1830.